Pomegranate seeds were osmodehydrated using date juice added with sucrose (final °Brix, 55) as immersion solution. The kinetics of osmotic dehydration showed that the most significant changes of mass transfer took place during the first 20 min of the process, regardless of date juice varieties. During this time, seed water loss and solid gain were estimated to be ∼39% and ∼6%, respectively. After 20 min of the process, the percentage of water loss and solid gain varied slightly and ranged on average close to ∼40% and ∼9%, respectively. During osmotic dehydration, there was a leaching of natural solutes from seeds into the solution, which is quantitatively not negligible, and might have an important impact on the sensorial and nutritional value of seeds and date juices. Both scanning electron microscopy and texture (compression) analysis revealed that osmotic dehydration process induced modifications of seed texture and cell structure. Sucrose was found to be the essential element which influences the texture of seed and the viscosity of date juice. Additionally, natural sugar present in date juice permits substituting 35% of the total quantity of sucrose added to the osmotic solution. This research was supported by Gembloux Agro-Bio Tech, University of Liege (Belgium), and National Engineering School of Sfax (Tunisia). Bchir, B., Besbes, S., Attia, H., & Blecker, C. (2010). Osmotic dehydration of pomegranate seeds (Punica granatum L.): Effect of freezing pre-treatment. 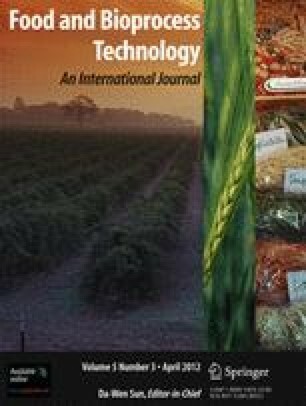 Journal of Food Process Engineering. doi: 10.1111/j.1745-4530.2010.00591.x. Devic, E., Guyot, S., Daudin, J., & Bonazzi, C. (2010). Kinetics of polyphenol losses during soaking and drying of cider apples. Food and Bioprocess Technology. doi: 10.1007/s11947-010-0361-1. Fathi, M., Mohebbi, B., & Razavi, S. (2010). Application of image analysis and artificial neural network to predict mass transfer kinetics and color changes of osmotically dehydrated kiwifruit. Food and Bioprocess Technology. doi: 10.1007/s11947-009-0222-y. Maity, T., Raju, P., & Bawa, A. (2010). Effect of freezing on textural kinetics in snacks during frying. Food and Bioprocess Technology. doi: 10.1007/s11947-009-0236-5. Mujumdar, A., & Law, C. (2010). Drying technology: Trends and applications in postharvest processing. Food and Bioprocess Technology. doi: 10.1007/s11947-010-0353-1. Nisha, P., Singhal, R., & Pandit, A. (2010). Kinetic modelling of colour degradation in tomato puree (Lycopersicon esculentum L.). Food and Bioprocess Technology. doi: 10.1007/s11947-009-0300-1. Uribe, E., Miranda, M., Vega-Galvez, A., Quispe, I., Claveria, R., & Di Scala, K. (2010). Mass transfer modelling during osmotic dehydration of jumbo squid (Dosidicus gigas): Influence of temperature on diffusion coefficients and kinetic parameters. Food and Bioprocess Technology. doi: 10.1007/s11947-010-0336-2.